What exactly is far infrared? Far infrared is part of the electromagnetic spectrum that is similar to visible light. It cannot be detected by our eyes because the wavelength is to long . However, it can be detected as heat by our skin and body. Far infrared is that part of the infrared spectrum that consist of heat waves that are longer and penetrate deeper into the body than ordinary heat waves. It is estimated that they penetrate up to 1 1/2 to 2 inches into the human body. 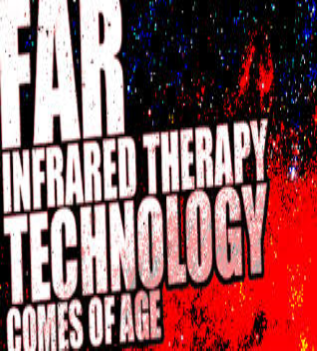 The far infrared reaches the skin, sub dermal layers, fat tissue, blood vessels, lymphatic vessels, muscles, organs and nerve tissue. The wavelength for far infrared is between 7-14 microns. Our bodies do naturally produce infrared waves in the same region to help keep us warm and to maintain health of our tissues. Most of our output is at 9.4 microns. It is estimated that about 50% of the energy emitted by the human body is in the form of infrared energy. Interestingly, the palms of our hands usually release infrared at 8-14 microns. This wavelength is unlike other forms of electromagnetic fields such as microwaves, cell phones, high tension power lines, electrical appliances, and computer screens that are suspect of causing health issues. The wavelength of these devices is much longer and does not seem to benefit the human tissues and as a matter of fact, there is growing information that they do cause damage to our DNA and other parts of our cell structure. This is not the case for far infrared waves. Far infrared rays do not cause damage to the skin that is caused by ultraviolet rays. As matter of fact, it actually improves the texture and helps in collagen production which potentially reduces signs of wrinkles and aging. Far infrared does not promote cancer. Studies have shown just the opposite, that it stimulates the immune system to attack cancerous cells, reduces and weakens cancer cells. More research is being done to evaluate the cancer reducing benefits. Far infrared appears to cause the water molecules in particular to vibrate and move differently causing groups of water molecules to disperse into smaller clusters. This increases the hydration ability of the existing water molecules. The far infrared also dilates blood vessels which improves the flow of blood through the blood vessels. The enhanced hydration, “loosening” of molecular bonds, and improved circulation also allows the body to free itself of toxins lodged in the various tissues and cells. The toxins are often released through thru the skin into the sweat. The toxins also enter the blood and lymphatic circulation where they are picked up by the kidneys and liver. The liver and kidneys then eliminate these toxins via the feces and urine respectively. There are a number of scientific studies to support the benefits of far infrared. Many of these studies do not involve large groups of people, but the results and benefits are unquestionable. Many of these studies were performed in Japan and Germany. Below we will summarize some of the findings. DETOXIFICATION: The far infrared waves as mentioned earlier reach into the body anywhere from 1.5 to 2 inches and causes a gentle internal warming and increases circulation. The combination of these two basic mechanisms begins the process of “loosening” the toxins bound in fatty tissues and other tissues of the body. The toxins are then caught up in the lymphatic and blood vessels. The toxins are eventually “filtered” by the kidneys and liver and then finally removed by the urine and in the feces. However, the other mechanism of toxin removal is by the skin. In the “Archives of Environmental and Contamination Toxicology” researchers concluded, “Induced sweating (from far infrared) appears to be a potential method for elimination of many toxic elements from the human body.” In the Journal of Environmental Public Health in 2012, researchers concluded that sweating deserves consideration for toxic element detoxification. Two additional studies by different researchers in the same publication concluded, “Induced perspiration may be useful to facilitate the elimination of potentially toxic phthalate compounds including DEHP and MEHP.” Another researcher also found that Bisphenol A (BPA) was also eliminated in the sweat. Ordinarily sweat is about 94%- 99% water and then consists of minerals such as sodium, potassium, calcium, magnesium, zinc, copper, iron, chromium, nickel and lead. It also contains small amounts of lactic acid, urea and cholesterol. However, in sweat induced by far infrared it usually contains about 80-85% water, the minerals just listed but, much higher levels of heavy metals such as nickel, lead, mercury and other toxins. Dee Ann Glaser M.D., professor of Dermatology at St. Louis University and specialist on hyperhydrosis (excessive sweating) agrees that sweat contains trace amounts of toxins, but also commented that the main organs of toxin removal are the kidneys and liver. I agree! However, the far infrared also assists the removal of toxins by the kidneys, liver and skin. PAIN RELIEF: The dilation of blood vessels, increased temperature, improved circulation reduces the muscular tension, improves flexibility and range of motion. The heating of the tissue improves flexibility of scarred or thickened , contracted tissue. Additionally, it also helps to decrease sympathetic stimulation by your nervous system and increased release of natural pain reduction compounds called endorphins. So, far infrared is helpful for fibromyalgia, joint stiffness, arthritis, chronic fatigue and other forms of chronic pain. WEIGHT LOSS: There are two mechanisms that occur during far infrared treatment. Firstly, you potentially loose weight by the act of sweating. You will burn .586 kcal per gram of sweat produced. So you lose weight not just water weight. Secondly, your heart rate, cardiac output and metabolic rate is increased resulting in your body burning increased calories. It is estimated in a 30 minute session you can burn 600-900 calories in some cases it was reported up to 2400 calories. Consider this, you will on average (depending on weight) by running a 12 minute mile you will only burn 450-740 calories. BOOSTS IMMUNITY: The slight increase in body temperature helps to inhibit the growth of pathogenic bacteria and viruses. Furthermore, it increases the activity of your white blood cells such as your T-lymphocytes and macrophages and releases other compounds called cytokines that stimulate the immune system. It also improves the lymphatic circulation. Lymph drains most all of our tissues and is an important means of transporting many of our cells that make up the immune system. BLOOD PRESSURE: Many studies have shown lowered blood pressure from far infrared. The dilation of the peripheral blood vessels decreases pressure. It also has been shown to release nitric oxide which causes blood vessel relaxation. Once again the decrease in sympathetic activity by the nervous system decreases blood pressure. Overtime it is believed that it may also improve the flexibility of the blood vessel walls. Studies have also shown that it also improves overall heart function as well. SKIN: Researchers at the Department of Dermatology & Cutaneous Biology Research Institute at the Yonsei University of Medicine in Seoul, Korea, found alleviation of wrinkles, dark circles under eyes, acne, scars and varicose veins. Other studies show increased collagen production, improved elasticity and improved wound healing with far infrared. It can help with psoriasis, eczema and acne. It does purge the skin and subcutaneous layer of the excessive bacteria and oils and kills bacteria which helps causes acne. Unlike other saunas this is a dry sauna so there is no steam, no smoke. It is more comfortable to breath in. The temperature is much lower 120-140°F rather than 190-235°F in an ordinary sauna , so it is much more comfortable. The heating from other saunas is not mostly in the far infrared spectrum. Approximately 80% of the energy is used to heat the surrounding air which then heats your body. So you are being heated from the outside in. However, with the far infrared 20% heats the air 80% penetrates your tissues and heats you from the inside out. Again this is much more comfortable experience regarding your lungs, skin and body in general. The volume of sweat is also about 2-3 times the amount compared to other saunas. Therefore, you will detoxify more effectively and burn more calories. This is a highly therapeutic graded sauna. It is constructed of unfinished aspen wood which does not out gas toxic wood fumes that may come from other wood such as cedar, spruce or pine. Furthermore, it is unfinished so there is no out gassing from stains or varnishes. It also contains ceramic heaters that emit mostly far infrared waves at the most therapeutic wave length of 9.4 microns. It is the lowest in emitting other EMF wavelengths. This is not the case with most other sauna heat emitters. Recent injury especially if joints are swollen. Wait until signs of acute inflammation subside. Active infection or high fever. Severe heart or cardiovascular problems. If have a bleeding disorder like hemophilia or are on blood thinning medication. Certain antihistamine medications that may contain ephedrine that increases heart rate or herbals that increase heart rate and other medications. Caution if you have lupus, multiple sclerosis or severe adrenal disease. History of seizures, fainting, dizziness or narcolepsy. How about implants are they safe? Patients with the following are safe to receive far infrared: joint replacement, pins, rods, screws, silicone breast and other implants, and those with pacemakers. What about children and the elderly? Children have higher metabolism so generally lower temperatures would be used. In the elderly population if the patient has problems with temperature regulation, is unable to sweat or on certain medications we do not recommend this treatment. Otherwise it is safe. What do I need to do before a treatment? Hydrate before the treatment. Better to have water and/or an electrolyte replacement. Not Gatorade! Avoid drinking a lot of coffee or other diuretics prior to treatments. Will I get MRSA or other infections? No. The bacteria, fungal organisms and others found on the human skin die in conditions over 113°F. We run the sauna between 120- 140°F. Furthermore, the sauna bench and floor are covered in towels and patients are not allowed in without a T-shirt or shorts. We also have natural products to sterilize the sauna. How often will I need treatment and how long are they? This all depends upon your health problems and/or health status. It is not uncommon to have 2-3 treatments for a few weeks to help with detoxification. Treatments are 20-25 minutes in length. When will I notice some changes? Everyone is different and some of the changes are subtle to drastic with respect to symptoms. Generally it takes several treatments and singular treatments may not do much to mobilize and remove toxins. Also remember if you are not doing anything to help your body to detoxify outside the treatments it will not be nearly as effective. This is why a diet rich in organic meats, vegetables, fruits, drinking purified water, taking the appropriate supplements, stress reduction and exercise is also part of achieving better health and detoxification.